The families of six men killed by either Crown forces or loyalist paramilitaries are to be awarded damages for unlawful delays in holding inquests, a High Court judge ruled on Tuesday. Mr Justice Stephens awarded #7,500 each for the frustration, distress and anxiety suffered by the next of kin in the serial delays. 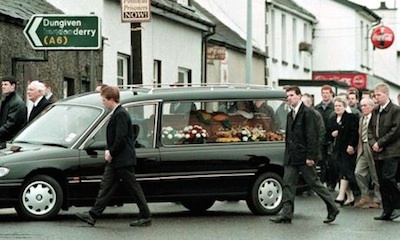 :: Pearse Jordan, who was shot and killed by the RUC in Belfast in November 1992.
:: Michael Ryan, one of three men ambushed and shot dead by the SAS in Coagh, County Tyrone, in June 1991.
:: Catholic man Fergal McCusker, who was kidnapped and shot dead in Maghera, County Derry, by loyalist paramilitaries in January 1998.
:: Neil McConville, the first person to be shot and killed by the PSNI following a car chase near Lisburn, County Antrim in April 2003.
:: James McMenamin, who died after he was knocked down by a PSNI Land Rover on Belfast’s Springfield Road in June 2005.
:: Steven Colwell, who was shot dead by the PSNI after he failed to stop at a checkpoint in Ballynahinch, County Down, in April 2006. Lawyers for all six families argued their human rights had been breached by the failure to examine the circumstances surrounding each death. In each of the cases it was argued that the state and the coroner breached their obligations to ensure prompt investigations into the deaths. The landmark ruling by the High Court’s Justice Stephens could now open the way for other claims involving delays in past killings. Judge Stephens said the investigation into the death of a close relative impacts on the next of kin at a fundamental level of human dignity. “It is obvious that if unlawful delays occur in an investigation into the death of a close relative that this will cause feelings of frustration, distress and anxiety to the next of kin,” he said. “It would be remarkable if any applicant was emotionally indifferent as to whether there was a dilatory investigation into the death of their close relative and such emotional indifference would be entirely inconsistent with an applicant who seeks to obtain relief by way of judicial review proceedings. Five of the pay-outs were made against the Department of Justice, while the verdict in the case of IRA man Pearse Jordan, shot by the police in 1992, was against the PSNI. SDLP Policing Board member Dolores Kelly said the inaction of PSNI Chief Matt Baggott had “compounded the grief” of the families who lost loved ones. Their lawyer, Fearghal Shiels of Madden and Finucane Solicitors, said: “This judgment is a damning indictment of the PSNI and its attitude towards families bereaved during the conflict.